Anyone who grew up in the ’90s undoubtedly remembers all the Cap’n Crunch commercials that aired during Saturday-morning cartoons. While most of the ads were super fun, there are a distinct four where Cap’n Crunch seemed way more interested in lunch meat than his own cereal. 1. The one where the Cap’n comes to the rescue of some kids whose babysitter has taken away their Crunch Berries but then gets distracted by liverwurst: In this 1998 spot, two kids send a distress signal to Cap’n Crunch after their mean old babysitter confiscates their Crunch Berries and orders them to eat gray slabs of liverwurst instead. While the Cap’n quickly comes to the kids’ aid, smashing through the wall in his giant wooden ship, he immediately gets sidetracked when he sees the plate of liverwurst. “I’d like a taste of this wet food,” the Cap’n mutters to himself, ignoring the children as he stumbles over to the liverwurst. “This food is mine,” he continues. “I bought this food with my money.” He then sits down on the floor, takes his shirt off, and begins joylessly stuffing the slices of liverwurst into his mouth one by one, not seeming to notice the kids crying for help just a few feet away as their babysitter drags them off by their collars to their rooms, putting them to bed while it’s still sunny outside. The ad then cuts to black suddenly, without the traditional ending shot of Cap’n Crunch as part of a complete breakfast. 2. The one where he seems to learn about honey ham for the very first time and is absolutely blown away: Anyone who watched Nickelodeon back in 1995 likely remembers this frequently aired commercial. In it, the Cap’n and a group of kids are sailing on his ship through an ocean of milk when, out of nowhere, some pirates pull up and declare that they’re going to loot the Cap’n’s ship of all its Peanut Butter Crunch. The Cap’n then says, “That’s fine, I don’t care, they give me the cereal for free,” and he asks the pirates what kind of food they have on their boat. The main pirate tells the Cap’n that they have some honey ham, and the Cap’n says, “What the hell is that?” Before the pirate can reply, the Cap’n announces that he’d like to come smell the honey ham, and then he climbs over onto the pirates’ boat and does just that. The smell of the honey ham sends the Cap’n into a coughing fit, and he loves it. 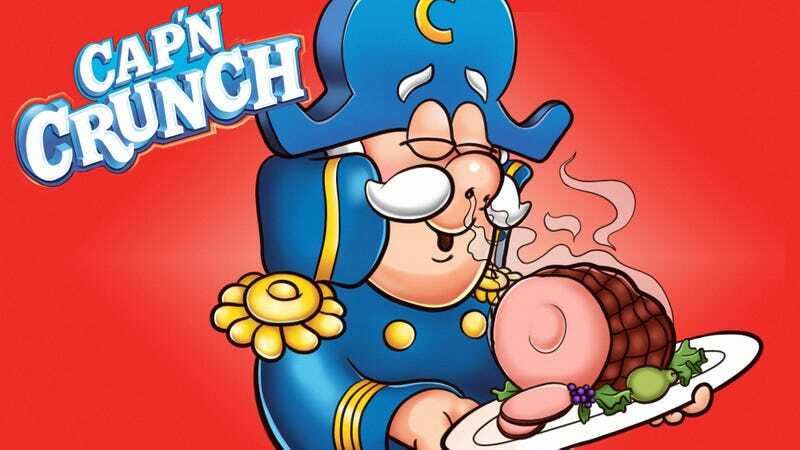 “Jesus Christ, this is the best meat I ever smelled!” the Cap’n screams, smashing the ham up against his nose to take another whiff. “I could smell this meat all goddamn day!” He then deeply inhales the ham’s aroma over and over again—his eyes wild and bulging—while the pirates ransack his ship and force his shipmates to walk the plank. 3. The one where some kids get into a pickle at a museum but the Cap’n can’t help them because he’s too busy fighting a homeless woman over pepperonis: In this classic 1993 commercial, we see a group of kids eating bowls of Crunch Berries in a museum when, all of a sudden, the loud crunch of the cereal sends a seismic shockwave that causes a T. rex fossil to collapse into a pile of bones. The kids call on the Cap’n to come help them reassemble the fossil so they don’t get in trouble, but the Cap’n does not heed their call. Instead, we cut away to a trash-strewn alley where an exhausted, sweat-drenched Cap’n is lazily wrestling a homeless woman for a bag of expired Hormel pepperonis that he covets greatly. “Give me the meat,” the winded Cap’n repeatedly barks at the woman. “I am a celebrity. Give me the meat.” Meanwhile, the kids back in the museum get in huge trouble with security guards and are forced to forfeit their Crunch Berries. 4. The Halloween commercial where the Cap’n hides from spooky monsters inside a dryer and wolfs down a family pack of bologna: This commercial begins on a stormy Halloween night, when two boys who are home alone look out the window to see a horde of spooky, cereal-crazed mummies, zombies, and ghosts staggering toward the house, moaning, “Give us Crunch, give us Crunch.” Sensing trouble, the Cap’n smashes through the wall in his big wooden ship, ready to save the day. However, he spots a tasty-looking family pack of bologna sitting on the counter and immediately loses interest in helping the boys. Instead, he grabs the bologna, takes his shirt off for reasons that are unclear, and climbs into the dryer so he can eat the meat in privacy. As the monsters move through the house terrorizing the children and eating all the cereal, the Cap’n, safely hidden in the dryer, absolutely goes to town on the bologna, barely pausing to breathe as he stuffs slice after slice into his mouth. “Oh my god, it’s so salty,” he moans euphorically. “Oh my god.” For the last 10 seconds of the commercial, the Cap’n just sits there chewing meat in the dark while off in the distance we can faintly hear the children screaming. It’s unclear what the advertising team was going for here, but as with all these ads where the Cap’n is pretty much solely occupied with consuming cured meats, we won’t be forgetting them anytime soon!